(1874-08-08) - What News, Soldier? Summary: Durans and his Limitanei arrive at Candeo bearing news, none of it good. Related: None specifically, the general logs regarding the imperial presence in Hellmouth and other qatunaxstories logs generally. It is a lovely late summer's day in the Ergonian mountains and maintenance is continuing at the Keep of Candeo, so recently recaptured from the dreaded Qatunax. The legionaries present are ever vigilant for the return of their foe, but since they took this territory and created a land bridge with the County of Hellsmouth, only fleeting contact has been made with the enemy in this sector. The calm is broken by the approach of a trio of exhausted looking fellows leading horses that are close to blown. They are Imperial, given their helmets, and wear the grey brown covered brigandines that only one unit in the Empire dons - the Limitanei, the Empire's and ears, reporting only to the Consul of the Legion though sometimes attached to Legions themselves. The Legio XIII's small band of Limitanei that saw them over the mountains in January was broken up after the capture of Paras, and most of them returned to the Empire to keep the supply route open. These three ARE coming from the north… maybe that's where they come from? Since Paras has been squared away, and a proper Steward placed there, Pompey now moves to train yet another steward in the ways of imperial ledgers and keeping of numbers. This includes a small census of who is who, what provisions are already in place ,and what a budget needs to look like for both general upkeep, as well as any improvements to this keep. It's Chancery business 101, and pompey is starting to feel homesick, mostly because he would rather be doing this in a marble laden office, rather than out in the messy frontier. Stepping outside, he takes note of the troops coming in, and the state of them and their horses. "Get these soldiers some water, and see to those horses." He orders as he walks up to the three. Lounging in an almost feline manner upon the walls overlooking the approach, Salys and Sylas sit shoulder to shoulder, watching the surrounding lands and those who move about beneath them. Legionnaires and other sundry members of the workforce patching up the keep after its capture from the Qatunax and the foolish Aequorians who sought to race Darius for control. It is with something of a smirk that Sylas looks to Salys, and Salys looks to Sylas. Though their armour speaks of Gens Therin for the most part, the approaching band wear very familiar armour to their eyes. Not that they need say anything to each other, there's a shoulder nudge apiece and a grin, partly feral, partly mischievous, partly intrigued. And a two pairs of green eyes watch the approach of the Limitanei, for the moment unmoving, there are other people who open gates and announce arrivals. People more suited to such tasks. Though slow and graceful, they at least rise and start their way to the grounds of the Keep. Moving side by side as one. The day had started for Alia as it always started, now, a brief few minutes of business to manage things with the troops, to review the work being done on maintenance and repairs, making certain that the work of the day was proceeding at pace. And then the practice yard, or at least the small space that had been marked off as one, to meet for her daily lesson on blades. As the announcement reached her that there were riders, she had lifted a hand, calling a halt to the practice. The wrap on her blade was slipped, the weapons set back into its sheath as she made her way to approach the incoming riders. "And prepare three more should they need to leave with any manner of haste." Being the fellow training young Alia in the art of swordsmanship is Centurion Maximus, of Gens Olympicus. His armor is beautiful and a cloak hangs from his shoulder as he wields in a blade in one hand, taking this session with her to show her the proper way to hold her sword and the more creative ways of parrying a strike, which he walks her through slowly. Before his eyes fall upon the riders that make haste to their position. He looks to a nearby grounds servant. "I imagine they have quite the story to tell." he sheathes his sword and makes way to greet the exhausted men…. who may bear news of the north. The three Limitanei look instantly grateful at the sign of friendly lines, and then, friendly soldiers. The one in the lead of the three horses raises his hand wearily to wave at them. "Hail to you, Imperials!" It's a voice that Pompey, at least, might now. Maybe others too, given that he headed the Limitanei in the journey from the Empire to hear - Tribune Rutilius Fulgentius Durans, formerly the Primus Pilus Centurion of Legio XIV before the Qatunax conflict, and now a lead officer in the Empire's elite eyes and ears. "It is good to see familiar faces. Water, please, yes." "Oh look brother, they look so happy. Apparently they haven't spent much time with the provincial swine," Salys chuckles to herself, she'll jump down if her brother does, though for now she's content to lean against him. "Should we go be friendly?" The chest piece of her armor is black as pitch, tooled with a design of a dagger twined with a pair of roses. "Yeah! Get them some water!" Salys says, whether she's kidding or not is anyone's guess. Pompey smiles and walks over to Durans and gives the man a hearty arm clasp. "Durans, what has you in a rush?" The Chancery Consul asks as he side steps to let the water be given, and the horses be tended to. "Has the road to Valesca fallen?" He asks with a raised eyebrow. "or did you get a local woman pregnant?" He says with a jest. "Why not dearest sister." A grin follows those words, and Sylas jumps with naught but a nudge of the shoulder to warn his sister. Taking the way down that is both swift and efficient. From one nook or hold or ledge to another, the stairs are so last season. And down there on the grounds, Sylas takes but a single step forward before halting, waiting only for his sister to join him at his side, "How fortunate they are, though some are more tiresome than others. Lets be friendly. We should at least salute the Tribune." A grin spreads across his lips, water. Water, water everywhere, and apparently quite a bit to drink for Limitanei. Alia, turning to see that fresh horses were being brought, leaves the tending of the spent beasts and the order for water to those soldier and auxiliary as have been assigned to those duties for the day. The machinery of the legion garrisoned at Candeo ran smoothly enough, and the auxiliary had been trained well enough that what worked needed to be done was done. A glance back and to the side take in the Centurion on his approach, as he'd not been far behind her, and the pair of twins meandering over. Neither cause her gaze to linger, before it returns to the newly arrived Tribune. When Durans gets closer, it's obvious that he's been doing hard travelling for quite some time. He's got a beard that has to be at least two weeks old, his face is quite filthy and he stinks like a man who's been living on the road. None of this is particularly abnormal for the Limitanei, but the exhaustion in him and his fellows, and the fact that the horses they are leading appear close to collapse is odd. They hand these horses off to Alia's legionairies and wave away the fresh ones, all the while gorging themselves on water. "We had to ride through the mountains. Small paths only. We lost one." He frowns. "The road from here to Valesca's been cut." He nods, gravely. Pompey frowns and looks around. "Take fifteen minutes, you and your men should get cleaned up, meet in this keep's great hall, we can talk there. " Pompey turns to Maximus and Alia. "I want all non essential personnel out of the great hall, and I want my lichtors on the door." he says before looking to the twins. "Both of you are with me, remember what;s said because I'm sending you both to Darius right after this." He says as he turns to head inside himself. "Valesca…. this could be a problem." Salys hops down with grace and smiles at her brother extending a salute. "Why of course, brother," she says loud enough for all to hear. "What news do you bring," she asks Durans, sending a knock into her brother's side. Oddly perhaps, Sylas takes in those present, his gaze flitting to Pompey and then to Durans, the others barely glanced at or indeed acknowledged, "Of course." The very words as ever spoken in nothing but Imperial as the Tribune is saluted, respectfully even, with that little act followed by a nod and a dip of the head to Pompey, "I am sure Darius will adore our company, will he not sister?" The Imperial words drifting easily and warmly, abruptly halted by Salys' 'knock'. Sylas grins crookedly. Seeing the fresh horses waved off, and taking that as some indication that they intended to stay at least for a while, Alia turned to draw one of the legionairies to her to get about the business of getting the three men offered what respite the keep has to hand. Before she manages a word, Pompey gives his command, and with a nod of her head, she sends the man off to do as the Consul bid. She too, turns, waiting the brief moment or two it might require for Maximus to match his step to hers, before she will attempt a departure towards the keep. Maximus's arms cross as he looks to Pompey as he gives the orders, saluting. "Yes sir." and he turns to do exactly that, ordering men to help him with the Great Hall, clearing it out of all non-essential personell as requested. By Maximus's message and through Pompey's command, Lichtors are indeed posted at the door. Then Maximus is listening. "Not good." he simply says to himself. Durans doesn't ever think to speak anything but Imperial. Why would he? All are Imperial here, right? And he's too tired. "Soon, soon. I'll tell you soon." He waves dismissively at the twins, and the trio of travellers step into the keep. Fifteen minutes later, the Great Hall has been cleared as Pompey has ordered. The three Limitanei are in there, stripped out of their armour and down to tunics - not really clean ones, as it's clear that they came out of their packs, but much beter than the wretched attired they sported before. They're already tucking into food and drink. Durans grunts. "Not looking good. They aren't idiots, the heathens, and they poured their horde onto the south side of Lakes Constantius and Divinity. They obviously intend to cut us completely off from home. Supplies lines as we have right now are wretched, and this makes it worse. They attacked north to that waystation between the two lakes, Castella Libertas. The garrison sallied and drove them back, but we've got no freedom of movement. Hard to tell how many there are. In the thousands, undoubtedly." He pauses. 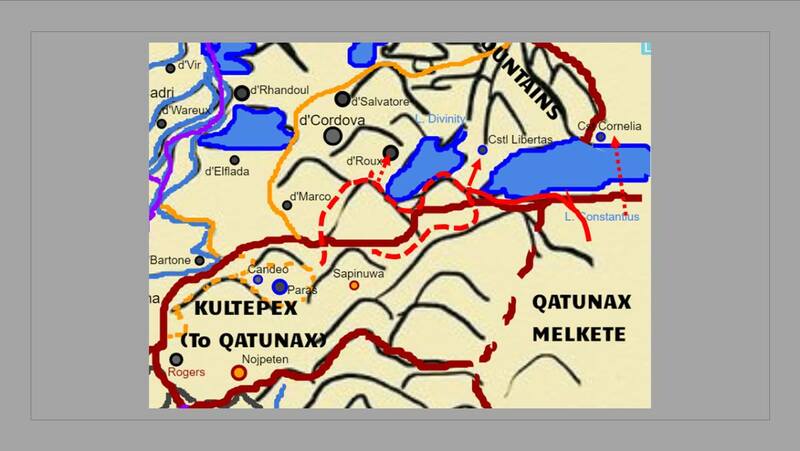 "Other Limitanei Spears have reported that they're massing another army for an attack on Castra Cornelia, just at the east end of Lake Constantius. That'd cut us completely." "Someone get me a map." Durans demands, rising swiftly from his seat. "Now." Pompey nods and takes a seat, he did have for some of his personal wine to be brought in, so it's of good imperial quallity. "So, the Qatunax are getting bolder, and with supply lines broken, we will have to find other means to keep our legion going until we can reopen the path." he says as he leans back. "Agreed centurion, not good at all." Hearing the command from the Tribune, Alia turns, moving away from where she was standing, not far from the men at their meal. Easy enough for her to find what's been needed, as they've for the most part, gathered such things into the room in the keep which serves as something of a meeting space and officer. A word to the lictors, and she steps through, rather than finding someone else to gather the required maps. A secret meeting is not, after all, very secret if people know what's you're about. Only a few minutes will be required to wait, before she returns with a handful of rolled maps, bound by tough white cording. Within the Great Hall, Sylas moves to sit upon the table itself, cross-legged and perched within viewing distance of the maps that are about to rolled out on the table. Nothing is said, little needs to be said, for Durans' report is nothing if not detailed and succinct in equal measure. Though no doubt, about to get a whole lot more detailed. And alongside him, Salys settles just as fluidly upon the table beside her brother. Perched like Siamese cats, green eyes focused ahead of them, upon Durans, and the maps. Maximus watches Durans gives his order, Map laid out of the entire surrounding region, Maximus keeps his arms crossed as he waits to hear the information. Watching as Alia gives orders and observing carefully her clothing and mannerisms, Durans asks anyone in the room. "Who's she? She's a foreigner, one of the Colonials? What is she doing in here?" He doesn't have malice in his voice, but it's a serious question that requires answer before he moves on. Pompey looks at Durans. "One of the people who's family used to live on this land before the savages came through, once we liberated it, she offered to join the empire, she is tribune of the auxilla." He says with a nod. "Darius trusts her, so she is fine." "Oh she's one of Darius' pets." Sylas offers warmly, his words as ever remaining the warm mother tongue of the Vir Sidus Empire, "Family were burned and flayed alive by the Qatunax, so either intent on revenge or a collaborating spy." Sylas smiles bright and warm, just a hint of the feral within as his voice lilts merrily while he leans against his sister, "I think she's out for revenge though, most likely on our side." "Oh she's one of Darius' pets," Salys says in unison with Sylas, then chuckles lightly as she scoots over to make room for the maps on the table. "Such a terrible tragedy, I'm sure," Salys says absently to Alia without making eye contact. Instead her eyes are on the table. "Revenge can be twice as sweet, though it can often leave a bitter taste in ones mouth. Isn't that so, brother?" Alia's eyes turned to Pompey, "That is not quite the case, Consul, the lands of d'Meloni lie west of Paras, and still under control of the Qatunax. I was taken into service of the Legion before we took this keep," her tone is lilting, the language imperial, rather than common, her accent impeccable. Her attention turned to the twins, the slightest curl of her lips offering the pair of them a smile that was all amusement, before she looked back to Durans, "I have given command of this keep once it was reclaimed." "Does she speak our tongue?" Durans asks, and is quickly answered by Alia. "Right, a citizen then I assume. At least one of those serving the Legion, that's all I care about." He gets to the map. "I'm going to deface this. I don't care." He takes one of the grease pencil that was brought in and begins to draw - this one has been dyed in the colour red through some arcane Vir Sidian alchemy. And he begins to draw lines. First they are bold lines. Then there are arrows. Then a series of hashed lines, and hashed arrows. "The bold means it's happened already. They've done those moves. We'll make sure the Princeps gets this. The hashed lines are for what they might or are likely to do. See, this one. They're very likely to attack Castra Cornelia. They've even got boats to do it, but I think that they're going to march around the east end of Lake Constanius and are just building this little fleet as a distraction. That's been sent back to Valesca already." He rubs his beard. "They already attacked Castella Libertas, like I said. They were rebuffed but it's basically cut off now. Luckily, they've got loads of supplies, and the cave network is easily defensible." He points at the other routes. "The southern route here is the most likely, if they're trying to reinforce the savages in our area. If not, they can march around Lake Divinity, and attack the Colonials here. Or, march south and attack us directly. Harder going, and through not so friendly terrain. Less likely, but possible." Pompey nods as he looks over the map. "So, the Melkete are either helping the Kultipex, or planning on taking them over, and us along with them." He says with a sigh. "Also, they are looking to push further into Aequor as well, it looks like they know that they can't go through us, so they will go around? we could move quickly to cut them off, but, the colonials won't like it one bit… they cry whenever we do anything.. I get so tired of their whining.. like children." Maximus looks to Alia amusedly as she speaks her mind, his eyes returning to the man of the hour as he points out what's happening. "It's their land. We wouldn't be too happy if they send an army on ours….even if their land was once part of the glorious empire." he shrugs. "I understand why they react in such a way." he shrugs. "They won't like it, but if I may, it seems a necessary evil if we want to stop whats coming…despite the amount of whining we would submit ourselves to." Salys sits back as everyone talks, taking it all in and picking at her nails. She eyes Alia when Durans asks if she can speak their tongue, she looks back to Durans, curls her lip down and offers him a shrug. "I wouldn't call it Imperial." Sylas replies with something of a feral, teeth bearing smile that is soon directed towards the map, though as the other speak, Sylas remains silent. Just drinking in the words of Durans, and leaning in towards his dear sister. Sibling support is all too pleasant a thing, even when such support is simply propping up another. Literally. Durans shrugs. "They might be, Consul. I don't know if they're looking at pushing further into the Colonials' lands. As you know, the savages are fractured into… countless kingdoms. And sub-kingdoms. They're loosely held together by the High King, who's a flatlander, as they call them. They fight each other often. These aren't forces of their High King. They're something different entirely, I've never seen savages dressed like them. Similarities, sure, but they fight in a distinct way. And they're more comfortable in the mountains than any others I've seen." Durans purses his lips. "I think that would be a grave error, Consul. We've got an excellent position here and good supplies. And the loyalty of the locals. But we're reliant on the Empire for a lot of our more important supplies, and now we're cut. Moving up to another area and stretching ourselves thin seems like it wouldn't be worth it." He's too focused on the map business to be amused by the twins' antics. Pompey nods. "Darius will have the final say anyhow, and he should be appraised of this. I can send both Therins to him with this copy of the map, and he can make an imformed choice on the matter." He says as he finaly stands up. "But yes, the road to valesca must be reopend, and thease mountain savages, well, we might have to get a few mountain fighters of our own, if any can be found." As soon as information as to her identity was given, the matter seemed to be dismissed, as Alia turned her attention to the map, leaning slightly in, the fingertips of her right hand supporting her weight on the table, her strong left reaching out to sketch the air above the map in the area where the hashed lines have been outlined. A glance towards Durans, then Pompey, the twins, Maximus, taking in the lot, "How knowledgeable are the scouts of the legion on the terrain in this area? It might do well to engage the assistance," the word offered with the slightest of inflections, "of such scouts and cartographers as the forces of the allied forces gathered in Hellmouth might have and set them to the task under our supervision. Make use of their knowledge, and risk less of our own forces. They have a full year, at least, more knowledge of how the terrain has changed since the Qatunax used their magics to disrupt the land, than we do." Again, to Durans, as she leaned in far enough to circle the air above the mark on the map which alluded to the settlement beyond Paras (Sapinuwa), "These are the former d'Meloni lands. And they maintained the pass here," she points, "and here. And all of the lands here." Again, she indicates before she steps back, "I believe we might be well served to make what use we can of them, if we can." "No indeed not," Salys says as she shifts to better bare her brother's weight, it's a smooth and natural movement that she's clearly done a million times and pays no further mind to it than that. Shoulder to shoulder with Sylas, her gaze slides over to the map, eyeing the tracings that Durans gave. "Hmm… how… fortuitous and yet terribly terrible a circumstance are these tidings brother?" Salys looks to Pompey and nods in confirmation, they'll pass it along to Darius. Maximus seems to pay extreme heed to the words being spoken. "Well said, Consul." his eyes fall upon Alia then as she speaks. "They are rather phenomenal scouts, Alia. I wouldn't be surprised if they had already gained the necessary knowledge needed." he knows full well those scouts are rather amazing. though he does look to Sylas with a raised brow. Noting his feral smile. Regardless, the Centurion keeps his eyes on Durans. "True." Sylas nods also to Pompey, shifting slightly against Salys for a brief moment, "Oh look, d'Marco… funny names they have." The words spoken curiously, quietly, the feral smile curving slightly into something more Cheshire-esque. A shoulder nudge gently rocks his sister, that and a glance and a glint within those green eyes of his. Pompey looks to sylas. "It means 'of marco' alot of thease family have taken their 'surname' from the person who established it, Korbina, Cordova, Juliano, Armaz, not all of them will be imperial, but about half are." "The Princeps is in Paras? We couldn't get there, or else we'd have gone there first. I'm glad to have found you in command of this place rather than some savages or colonials. We'd have had to probably skirted it if they'd been in command of it." Says Durans. His eyebrows knit inward at Alia's comments. "Quite well, I'll have you know. And we know the enemy much better than the Colonials, whether or not we do the terrain." He looks at the marks she's making. "They move a lot less over those passes than what you might think. I don't know who or what, but something has attacked them more than once when they've moved big groups through. They try not to. But these mountain savages moved unmolested." He shrugs. "It's probably from the name Marcus. Maybe their first lord was a Marcus. They're all Imperial along the mountains, you know. My family's from the Valesca side of the mountain near the Rhodanus pass." That's the Imperial name for Rhone. He shakes his head. "No need to get into a genealogical lesson. The auxiliary is right. We can rope some of them into helping us and they can soak up arrows or what have you for us." Sylas almost makes a snoring noise, "It was like I travelled back in time to the Academy…" The very words whispered to his sister, punctuated as they are by a shoulder bump. Pompey nods. "Well, sitting here and talking about it more will do us no good without Darius here to assess and agree. We are a Legion, not a senate." He says as he motions to one of his luchtors. "Have the help staff see to the visitors, and make sure that they are well taken care of. As for the rest of you, business as usual, but double the patrols, when Darius is ready to move, then we shall be ready." he says as he looks to each of them. "as for me, I'll retire, there is still work to be done, the world doesn't stop because some savages have gotten bold." Alia listened quite quiet attentiveness, as Durans gave his reply, her head tilting in curious fashion, as he told of something in the pass which seemed to be able to retard the movements of the enemy. And that brings her up to her feet, her hand pushing her away from the table, "Would it be worth it to see if we can discover the nature of this interference in the pass?" She turned to Salys and Sylas then, the two most skilled scouts she had met yet in the legion. "If it is a force which we could bring into our allegiance…" She glanced to Pompey, the rest of her thought momentarily held, "A good night to you, Consul." Durans gets rapidly back on topic. "There are over ten thousand of them. We don't have real figures, but that's from stringing together all of the Limitanei's observation reports over the last two weeks. Whatever you need to do, do it, Consul. I don't know what their intent is, and I'm sure that Paras can hold out for quite some time, but the sooner we get ready the sooner we can do what the Princeps decides." He frowns. "I'll leave it to you to decide what you will do. Get Colonials, or do it yourselves. You decide." "Better our allegiance than the Colonials, though given how the Colonials manage diplomacy, they'd likely find a third front winging its way towards them. Deservingly so." Sylas offers as he sits up straight, no longer needing the support of his dear sister, arms stretched high above his head, "Farewell dearest Pompey, sleep well and safe." The final word spoken with a daring hint of mischief, even as the feline-esque motions of the Scout continue, for there's a good many cricks to work from his back, "And yes. The more Colonials we throw towards the arrows, the better. Clean up their incestuous family trees somewhat, prune a few curly branches." Salys looks at Alia and shrugs. "I don't tend to jump ahead of the race, my dear. I usually bring things to my Princeps and he tells me where to go," if she were an actual cat she'd be preening herself right now. Mischievous isn't even the proper word for the grin that's on her face, but it's the closest, "but I have… ideas. I will be sure to share them with Darius." She blinks her lashes sweetly before she whispers in her brothers ear, "mayhap I'll bring the special wine, brother?" She does laugh at his unkind words about colonials and their idea of diplomacy, "Quite right!" "I never imagined you to do any less." That, in answer to Salys' commentary, before she returns to Durans, "Given the size of the force, and the movements that you marked as you traveled, would it be possible for you to venture a guess as to how quickly they might be ready to move into the areas you have marked? Or how quickly they might be able to move in force against Paras? You said that you could not get there from where you were traveling." "I'll be heading back out to see what else we can find." Durans confirms with Salys. "But he's the Praetor here, and he's got to make the decision. While I'm away, you two are the lead Limitanei as advisers to him. Don't do anything I wouldn't." He smirks, finally, knowing that his reputation is far more upright and unsullied than those of the twins. And then he winks at them. Surely he couldn't have meant that, right? "I'll keep feeding information to you in Paras as I get it. And as often as I can." He shakes his head at Alia. "No, I'm afraid it's quite impossible for me to know that. Firstly, will they be molested by the same things that attacked the savages we know when they crossed the mountains? Don't know. Secondly, how will they transport supplies and so on? Don't know either. Are they friendly with our neighbours? Don't know." He shakes his head sourly. Not at Alia, but the situation. Sylas settles once more to sitting upon the table, cross-legged, enjoying the breeze, "Who knows, we might even hear something of what you speak, odder things have happened. Like Colonials speaking our tongue, mangling it as ever. I've heard ground rocks make more sense." That said, Sylas grins at the Tribune, "Do stay safe, we'll so miss you if something were to happen, wouldn't we sister?" "Oh, don't tempt me with a good time, Durans," the cat-like eyes of Salys wrinkle up with joy. "Besides, what is it that you wouldn't do, exactly?" there's a smirk there before she falls silent, nodding to his words about sending them more information. "Ah. Sounds absolutely splendid, Durans. I promise I'll write you back," She waggles her eyebrows at the Limitanei before she decides braiding her brother's hair is the most interesting thing in the world. "Oh yes, we would certainly miss him. Certainly." Maximus simply watches on amusedly as others speak around him. Before he eventually turns around to leave. "I'm going to go prepare. Have fun." Maximus as soft spoken as always, makes his exit with that. Well…least he's friendly…. "That's a good question. I serve the Empire." Durans replies, cryptically. "Only send correspondence through trusted couriers. The terrain is hard, and the locals are harder." The Tribune of Limitanei nods to Maximus. "Centurion." Alia's expression remained thoughtful, as she listened to Durans' answer, not offering any of her attention to the conversation going on between the three still at the table, eyes drifting back down towards the map, "I will have a clean copy of the maps prepared, and stores have already been set aside for your use." She dipped her head towards the maps, in silent question as to whether or not Durans had finished with them, "If I may?" A glance towards Maximus as he made his departure, "Centurion. A good night." Sylas slides from the table with a certain grace, an almost silent landing also as he 'dismounts' and adjusts his armour somewhat, "Well this has been a pleasure. Truly." The words having likely sunk into some part of the Scout's mind, though one would hardly credit it given the way he simply saunters away from the map with but the barest of glimpses, making his way about the table to lean once more against his sister, "Is there anything you would wish us to pass on aside from…" Sylas waves dismissvely towards the map with a wave of his hand, "… this." "Oh… I will," Salys says with a wicked grin as she braids Sylas' hair idly. "We should talk one day of how you serve the Empire…" She says in a sing-songy voice before looking up, "I'm thinking of writing a book." She giggles to herself before she stops her idle braiding as Sylas stands up. Durans nods at Alia and indicates that he's done. The other two Limitanei that had entered with him have been silent but attentive this whole time, one of them taking notes on some parchment. They are all, in the end, supposed to be able to scout independently and know many things, and always be preparing for occupation of higher roles in their peculiar organisation. His stirring causes them to rise up, and he nods at Sylas. "Yes. Tell him these mountain people are not to be trifled with. They don't seem to have the same affinity for fire of the others, but they're good fighters. They don't throw their forces at us in the same way as these ones. I'll be off then. Need to reprovision, change, eat and sleep. Then we leave." Salys waggles her fingers at Durans. "There are rooms in the barracks that have been prepared for you to do all of that, good eve." She falls silent, and will stay as such until her brother makes to leave. She'll follow along when he does, more than likely to their rooms in the dungeons. It is Sylas' turn to idly braid his hair amidst that of his sister's, linking the two by a few glossy strands of long hair, fingers drifting easily as the twin's are joined once more, even as Sylas' eyes drift back to Durans, "Wonderful. We should prepare also, should we not sister? We have scouting to do." A shoulder bump offered and the linked hair let go, not that he moves to far from his sister as he stands there, the hair bridging the gentle gap between them, "Perfect! Always a pleasure, truly." The words offered merrily to Durans, and alongside his sister, away Sylas goes. Alia leaned forward carefully rerolling the maps, quick hands retying their bindings and gathering them up, as she stepped back from the table, "I will have the copies prepared for you in time for your departure." And with that, she prepared to make her own way out of the room, "Though it was your duty, Tribune, still, thank you for your efforts to bring us the news here. You have given us the opportunity to ensure that the keep will be ready, should the threat come this far, and I thank you for that."